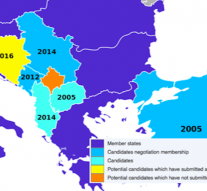 A merit–based process: the EU-Western Balkans enlargement strategy, published in February 2018, confirms this concrete and realistic approach that relies first and foremost on the hand of the countries themselves. The eve of the publication was characterized by the risk of having an “asymmetrical” approach, with Serbia and Montenegro to lead the process obtaining a clear perspective to enter the EU by 2025 and the other countries to be left behind. The Strategy refutes this visions. Of course there are differences among the six Western Balkans (WB) countries, but the process should be evaluated just on reforms and concrete results through this path. “Kosovo cannot compare itself with the neighboring countries which have started with reforms for quite some time now” Kosovo’s Minister for European Integration, Dhurata Hoxha, said after the publication. And at the end of the day, the EU stressed clearly that the WB will be able to join the Union once the criteria of Article 49 of the Treaty of the European Union, including the Copenhagen criteria, are met. Another crucial message is that the EU door keep being open, although the initial wave of eastward enlargement that started in 2004 dragged on until 2013, when Croatia became the last country to join, and there is some concern within the EU that some countries had been let in too soon. The Strategy envisages the steps that need to be taken by Montenegro and Serbia to complete the accession process in a 2025 perspective; while others could catch up, Montenegro and Serbia are the only two countries with which accession talks are already under way. But the EU highlighted that all WB countries have the chance to move forward on their respective European paths. Albania and the former Yugoslav Republic of Macedonia are making significant progress on their European path and the Commission is ready to prepare recommendations to open accession negotiations. The Commission will start preparing an opinion on Bosnia and Herzegovina’s membership application; Kosovo has an opportunity for sustainable progress through implementation of the Stabilization and Association Agreement. Moreover, the EU stressed in the Strategy that special arrangements must be put in place to ensure that future Member States are not in a position to block the accession of other Western Balkans candidates. This is a key provision to ensure that what the High Representative Federica Mogherini said will be true: “The Western Balkans are part of Europe” and the key objective is “for all our six partners to overcome once and for all the past, for all of us together to make the process of the Western Balkans towards the European Union irreversible and keep reuniting the Continent”. It has to be remarked that for all the countries of the region, a credible enlargement perspective requires sustained efforts and irreversible reforms. Progress along the European path is an objective and merit–based process, stressed the EU strategy, which depends on the concrete results achieved by each individual country. As commissioner for European Neighbourhood Policy and Enlargement Negotiations Johannes Hahn highlighted: “With the new approach, underpinned by concrete measures, we are strengthening the enlargement process which requires credible efforts and reforms in return in particular to strengthen the rule of law”. In this regard it is important to underline that the European Commission announced six flagship initiatives: specific actions that the EU will take over the next years to support the transformation efforts of the Western Balkans in areas of mutual interest. These range from initiatives to strengthen the rule of law, reinforced cooperation on security and migration through joint investigating teams and the European Border and coast guard, expanding the EU Energy Union to the Western Balkans or lowering roaming charges and rolling out broadband in the region. Concerning the Employment and Social Affairs issues, it is crucial to say that the European Commission proposes to gradually increase funding under the Instrument for Pre–Accession Assistance (IPA) until 2020 in so far as reallocations within the existing envelope allow. In 2018 alone, €1.07 billion of pre–accession assistance for the Western Balkans is already foreseen, on top of almost €9 billion from the 2007-2017 period. Addressing unemployment remains a key challenge. Also from this point of view there are huge differences among the countries in the Balkans: as regard potential candidates, the unemployment rate in Kosovo reached 30.4% up from 27.1% noted in 2017, while in Bosnia and Herzegovina it is still lies at 38.8%. Among candidate countries the situation is quite better: in Albania the unemployment rate declined to 14%, in Macedonia to 22.1%, in Montenegro to 15.1%, and in Serbia to 12.9%. In order to address this challenge, in particular to offer new chance to young people in the Balkans, the EU Strategy includes the “development of a robust private sector led by entrepreneurs both from within the region and from the EU”. And with the aim to boost entrepreneurship and innovation, the EU “will roll out a scheme supporting technology transfer and start–ups across the region”. The EU Strategy also proposed “a new reinforced social dimension for the Western Balkans countries”. To this end, enhanced support should be provided to education and for this reason funding under ERASMUS+ will be doubled to help even more young students from the Balkans to study and gain experience in the EU. Finally, a key measure contained in the strategy is related to the EU digital single market: the Commission will launch a Digital Agenda for the WB, including a roadmap to facilitate lowering the cost of roaming. And support is assured to provide the broadband in the whole region. Those are also top priorities for the Bulgarian presidency of the EU, that is just working concretely on them waiting for EU-Balkans summit in Sofia scheduled for next May.